Timed perfectly on the second anniversary of the release of "Alone In The Universe" and just four days before the much anticipated multi-format "Wembley Or Bust" hits the shelves, Jeff Lynne's ELO finally confirmed an initial total of 29 dates in the UK, North America and Europe earlier today (Monday 13th November). 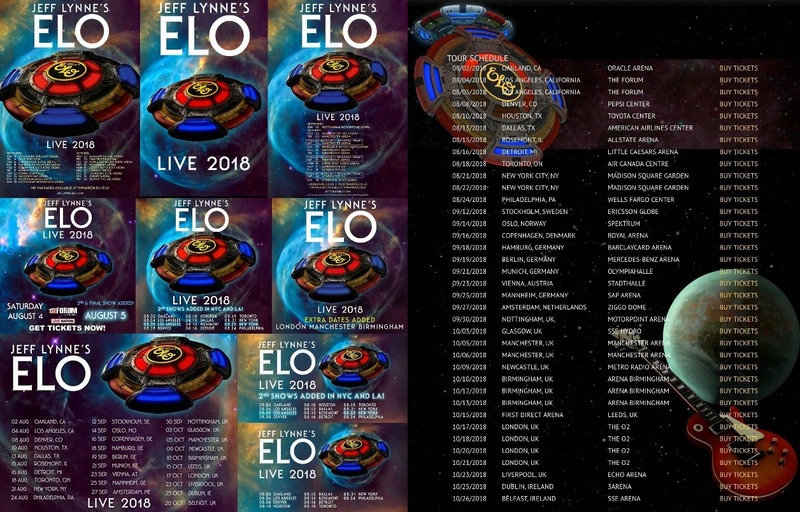 This will be the largest ELO tour (hopefully with Richard Tandy back on board) since their 1981-82 "Time" dates and includes the most extensive set of US dates in 35 years as well as a handful of welcome gigs in Scandinavia. We also look forward to the release of a new Jeff Lynne's ELO studio album next Spring/Summer in advance of the above as yet untitled tour. Expect more UK dates in Birmingham and London to be announced upon buoyant ticket sales (as there are plenty of gaps in the schedule) too. Additional dates elsewhere (perhaps in Australia/New Zealand) are also a possibility. Good luck with your ticket purchasing! elobeatlesforever (elobf) recommends Jeff Lynne's ELO Live 2018 to those enlightened folks who love ELO, Jeff Lynne, Roy Wood, 'Brum Beat', The Idle Race, The Traveling Wilburys, The Move, The Beatles and related artistes.